Enjoy some writings by members of our group. "only three more 'till the halfway"
I just finished reading an article in Runners World about a former U of D runner and he had some great comments. He wasn't as fast as the other runners but still felt a camaraderie that he had never experience before. 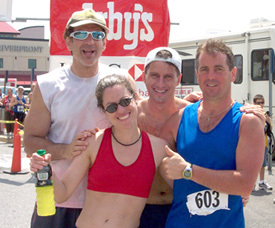 He states even though he was out of his league, they all shared a genuine love for running. That made him belong. I feel this is what the Rebels is all about , it doesn't matter if you are fast, slow, whatever.... it is about the journey and run together as friends! And of course the food and drinks after! "Doing it is good enough in running; it's truly not whether you win or lose but how you play the game. Not once did I consider myself varsity-worthy as a Blue Hen. But I did feel like as if I belonged." I don't always feel like I belong in running because I am a very average runner, but that is why the Rebels are awesome because all YOU do make me feel like I belong!!! Thanks for all of the support and encouragement and you will all be with me in NY on Sunday! I leave you with this thought from a picture I took at the Boston Marathon. It is now the picture which comes up when I start my computer. A big banner in Framingham said: "Remember, running it is nowhere as painful as never having had the chance." I'm thankful not just at Boston, but every time I run.